(L-R) KAAN GULDUR as Kid and JACKIE CHAN as Mr. Liu (a.k.a. Master Wu) in the new animated adventure “THE LEGO® NINJAGO® MOVIE.” ©Warner Bros. Entertainment. CR: Mark Rogers. HOLLYWOOD—Martial arts expert/comedic actor Jackie Chan has been making movies for five decades. Never before has the Chinese actor depicted a Ninja until now. 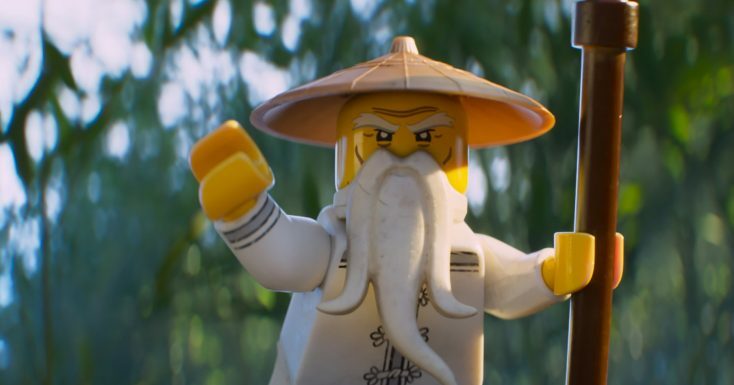 In “The Lego Ninjago Movie,” the third installment in the Lego movie franchise, he provides the voice of Ninja Master Wu, a wise and respected teacher. The 63-year-old Hong Kong native is no stranger to the animated world. 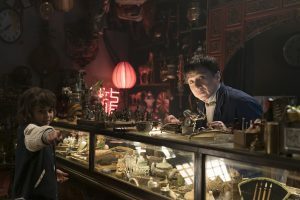 He voiced the main character in the 2000 TV series “Jackie Chan Adventures” and he was the voice of Monkey, a kung fu master in the 2008 box office hit “Kung Fu Panda.” He’s also demonstrated his martial arts skills in dozens of live-action Hong Kong and Hollywood films over the past half-century, notably the “Rush Hour” franchise. “The Lego Ninjago Movie” follows on the heels of box office hits “The Lego Movie” and “The Lego Batman Movie,” which depict worlds where the popular plastic stacking toys are brought to life. Co-directed by Charlie Bean, Paul Fisher and Bob Logan, the story centers on young Master Builder Lloyd, a.k.a. the Green Ninja, along with his friends, who are all secret ninja warriors led by Master Wu. They are challenged to defeat evil warlord Garmadon (voiced by Justin Theroux), The Worst Guy Ever. He also happens to be Lloyd’s dad. Pitting mech against mech and father against son, the epic showdown tests the fierce but undisciplined team of modern-day ninjas, who must learn to check their egos and pull together to unleash their inner power. Chan’s Master Wu tries to teach the ninja students that they have a greater power within and to look at problems they facing in a different way. The animated adventure also features the voices of Dave Franco, Michael Pena, Kumail Nanjiani, Zach Woods, Fred Armisen, Olivia Munn and Abbi Jacobson. Chan spoke at a recent press conference held at Legoland California to talk about his newest animated role in which he plays a teacher who is as wise-cracking as he is wise. Q: What was it about the project that appealed to you? Chan: I wanted to do it because I do a lot of action movies that sometimes kids can’t go see. With this one, I thought, “How can I let the children know me too?” A long time ago, I did an animated series called “Jackie Chan Adventures,” so whenever I travel around the world, whether it’s in Germany or Morocco, the children go, “Jackie! Jackie!” Even now, people say I’ve watched your movies while I was growing up, and I’ve been making movies for 57 years now. I want the children, before I pass away, to remember me. This is why I wanted to do a Lego movie now—to save it for the future. Master Woo will never die. Q: How early on did you know you were going to not only give voice to Master Woo but also do the design and choreography with your stunt team? How was the process going through that? And now that you see the result, do you feel the Lego team did what you want? Chan: First of all, I don’t know why they hired me for my voice. I don’t speak perfect English. I asked the directors, “Why me?” And they said, “Because that’s what we want. You’re a master at speaking Jackie Chan English.” And I said, “OK.” Later on, there were times (during production) when I said the action makes no sense and I told the directors, “No, it should be like this or that.” We would sit down and talk about ideas, hiring a stunt team and teach them the movements. We are all actors on the set. Q: What’s your favorite line from the movie? Q: You’ve done “Jackie Chan Adventures,” “Kung Fu Panda” and now “Lego Ninjago,” has animation been good in showing how martial arts are performed and what martial arts can do? Chan: Yes, because sometimes with martial arts you can have limits. In cartoons, you’re not limited with martial arts. You can do anything and everything and you never get old. I just finished a new “Jackie Chan Adventures.” It’ll probably be released later. I hope children can see it. Also, they have good messages to children—to respect everything. Q: What advice would you give to young people who want to learn martial arts? Chan: Just practice. You don’t have to practice to knock somebody down. Think of martial arts like exercise. It’s good for your brain. It’s good for your health. It’s good for everything. When you know martial arts, you respect everybody—your parents, your teachers, Nature, the whole world. I think martial arts is kind of a good exercise/sport. I spent three years in China, Hong Kong, Australia and America to do this character. Now, I know how famous (Legos) are because I didn’t grow up with ninjas or Legos. This was the first time.